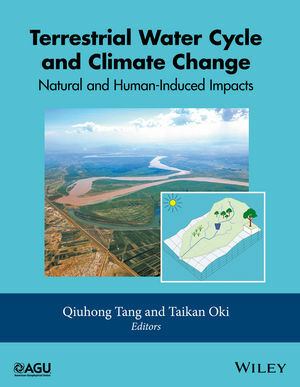 The Terrestrial Water Cycle: Natural and Human-Induced Changes is a comprehensive volume that investigates the changes in the terrestrial water cycle and the natural and anthropogenic factors that cause these changes. This volume brings together recent progress and achievements in large-scale hydrological observations and numerical simulations, specifically in areas such as in situ measurement network, satellite remote sensing and hydrological modeling. Our goal is to extend and deepen our understanding of the changes in the terrestrial water cycle and to shed light on the mechanisms of the changes and their consequences in water resources and human well-being in the context of global change. The Terrestrial Water Cycle: Natural and Human-Induced Changes will be a valuable resource for students and professionals in the fields of hydrology, water resources, climate change, ecology, geophysics, and geographic sciences. The book will also be attractive to those who have general interests in the terrestrial water cycle, including how and why the cycle changes. Qiuhong Tang is a Professor in the Institute of Geographic Sciences and Natural Resources Research at the Chinese Academy of Sciences in Beijing, China. His research focuses on Land surface hydrology, Global change, Remote sensing hydrology, Water resources. He has published extensively in many geological journals including the prestigious Nature Climate Change, Proceedings of the National Academy of Sciences, USA and AGU journal Geophysical Research Letters. He is a professional member of the American Geophysical Union (AGU), American Meteorological Society (AMS) and Geographical Society of China (GSC).